If you don't find the answer to your question, send us an . The amount of paint, resin and fiberglass cloth will vary with the size boat you build and the amount of area you choose to cloth. To cloth the seams on a 15'7" boat you will need sixty four feet of cloth 4 to 6 inches wide. . If you choose to cloth the bottom on the outside you will need a piece thirty two to thirty six inches wide and sixteen feet long. The amount of fiber glass resin will be determined by the area you plan to cover. I normally cloth the bottom on the outside, running four to six inches up the side boards and the inside seams. Then paint the entire boat with resin. If you only tape the seams and don't paint the entire boat you can get by on a quart of resin. If you cloth the bottom, inside and out, and paint the entire boat you will use one to one and a half gallons of resin. On your first trip to the lumber yard, pick up two sheets of plywood, lumber for the rub rails, glue, and a few one inch screws. Don't worry about getting everything on the first trip. With this basic set of materials you will assemble your boat. Then comes the finishing step. By picking up the finishing materials, fiberglass cloth, resin and paint on a separate trip you will have the benefit of giving thought as to how you want to finish your boat as you build it. I always change my mind several times. If you can't find 3/4" lumber for in the length you need, look in the molding department for suitable lumber. Molding is generally fir, straight and clear. You will pay a bit more than ripping your on but it's an area you can be creative. One builder ripped full round (closet rod) in half and had a rounded rub rail. Because the stems and rib sets are precut to the proper angles, the boat can be built with the minimum of tools. It is possible to build the boat using only hand tools. You will need to rip the plywood, (table saw, skill saw, jig saw or hand saw). 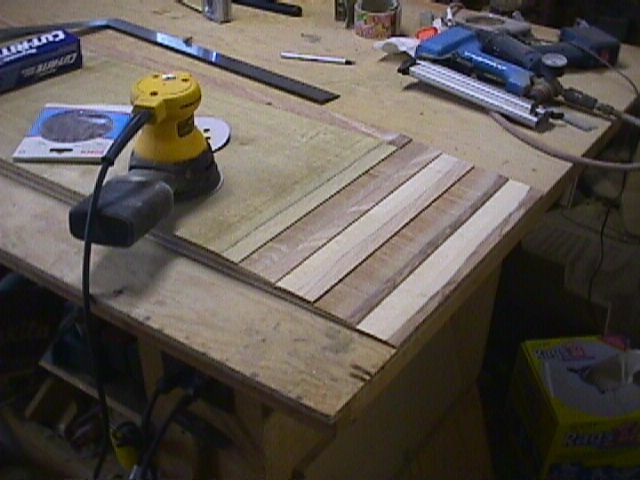 You will need a sander (a random orbit sander like the DeWalt is very handy, a belt sander or pad sander works well). A jig saw is the tool to use cutting the bottom. Yes. The length of the finished boat is determined by the length of the sideboards. Using two sheets of 4' x 8' x 1/4" plywood a boat can be built from 12' to 15'- 8". We do not recommend less than 12'. Building the boat less than 12' will compromise the stability. The "best" size will differ with the individual and usage. A 12' will offer a small, light, easy to carry boat for one adult or two children. A 15' - 8" will offer the greatest capacity. A 14' - 6" offers the best of both. Make your decision based on your needs, the amount of weight you want to carry. The longer your boat is the greater the capacity. You can widen the boat by using a fourth rib set. Check here to see a "four rib boat". Using a fourth rib set will increase both the stability and the capacity. You can copy the center rib contained in the kit or we sell the extra set for $15.50 (including shipping). 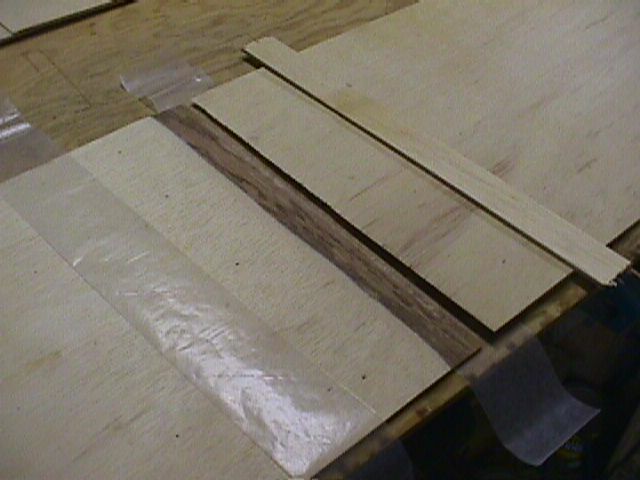 The fourth rib set is shipped separately. 3/8" for the bottom and 1/4" for the side boards. The sides can be raised an inch or the bottom may be made wider but not both without purchasing additional plywood. A sheet of plywood is forty eight inches wide. When you rip two ten inch pieces you are left with twenty seven and three quarters for the bottom. You loose a the width of the saw blade on each cut. If you raise the side boards by one inch, you will be cutting two eleven inch pieces, leaving just under twenty six inches for the bottom. The stem will be short, however you can hide this when you bring the rubrails together on the stem and deck over the end to cover the top of the stem. The center of gravity has a profound effect on the stability of a boat. I normally discourage individuals from raising the side boards for this reason. First, build the kit and then fit a 3/4" plywood transom where you want it. Cut off the end of the boat flush with the transom. Caution should be exercised when using a motor. An electric trolling motor is more than adequate to propel a craft of this size. Click here to see a folding seat designed for our Pirogue. Click here to read a builder's comments. The stability of a pirogue is somewhere between a canoe and a kayak. My best suggestion is to read the comments made by builders which range from "Hey the boat works great, it took some getting use to, but I haven't tipped it over. (yet). " to "We didn't sink at 470lbs. It's comfortable with 350lbs. I built the 16ft version. ", "I am 6'1" and weigh about 235 lbs and the boat carries me without any difficulty. ", and, "My kids and their friends have been out in the boat many times now and they have never tipped it over". A lot of the feeling of stability comes with experience and depends upon the individual. The longer the boat the more stable it will be. Increasing length does not greatly increase weight, the boat shown on the main pirogue page is mine. It is 14' long and weighs 38 pounds, increasing the length to the maximum of 15'6" will only add a few pounds and still should be well under 50 pounds. You can also increase the width. A twelve foot model without paint or fiberglass weighs approximately thirty pounds, a maximum length model, approximately 40 pounds. The actual weight will vary with the amount of fiberglass and the number of coats of paint used. One builder reported that he clothed the entire boat with generous amounts of resin and paint. He has a fiberglass boat with a plywood core that weighs just over sixty pounds. Another builder went for as light as he could build it, one eighth inch plywood with three ounce cloth on both sides. His boat weighs in at twenty eight pounds. A hunter that is going to be putting his boat through rough usage may choose to use three eights plywood on the bottom. This will add a lot of strength with only the amount of weight of the extra one eighth inch. The boat on the top of the main page is fourteen feet long, the outside bottom is clothed and the inside seams are taped, the entire boat was painted with resin and then with polyurethane. It weighs thirty eight pounds. The ultimate weight of your boat will vary with your needs. The pirogue by design is a very fast boat, easily propelled through the water. Double bladed kayak paddles that breakdown are ideal. One of our builders sent us photos of his boat and a discussion of trolling motor performance. This builder offers not only photos on attaching the motor but discusses electric trolling motors in depth. If you are thinking about using an electric trolling motor click here to check out his comments. There are numerous waterproof and water resistant glues on the market. For the most part, glues, nails and screws hold the pieces together prior to fiberglassing. Once the seams are taped, the fiberglass will provide a strong waterproof joint. For this reason, the type of glue is of less importance than fiberglassing the seams. The glue we use is Titebond II, a one part waterproof woodworking glue. It says "not for marine applications" on the label. But after the seams are fiberglassed the glue will be incidental. It's not necessary to purchase expensive exotic glues. I've found that sometimes the 'exotic' glues are exotic only in price. If you use polyester you will typically spend thirty five to fifty dollars and with epoxy it will be one hundred to one twenty five. Although epoxy is somewhat more expensive than polyester it is more forgiving to use, is stronger and more stable. (1) 1.5 gallons of epoxy, this should be enough epoxy for all gluing, filleting and epoxy coating and saturation of the fiberglass. The cost of these materials is about $200.00. Extra materials, you might consider are mixing pots, a squeegee spreader and latex gloves." RAKA has a very good product at a reasonable price and provide excellent support. If you give them a call (772-489-4070) and tell them you're building out pirogue they will know just what you need. Actual assembly time in general is 10 to 12 hours for the average novice. As a weekend project, on Friday the ribs would be glued and the sideboards and bottom would be sized and scarfed. On Saturday the boat would be assembled and the seams fiberglassed. On Sunday the assembled boat would be sanded and painted. The time required is determined as much by the time necessary for the glue, fiberglass, and paint to dry between steps. Although it's possible to build the boat in a weekend, two weekends and the evenings between is a more realistic time frame. More often than not individuals will choose to add extras like breast hooks or small decks or gun rails and take a longer period of time building their boat. The kit plans do not include the information necessary to make any of the items contained in the kit. The full building plans contain all of the information necessary to build the parts contained in the kit. You do not need both. Your total cost including the kit will range from $125.00 to $200.00. The actual cost will be determined by the the quality and amount of paint and fiberglass used. We recommend tapeing the seams inside and out, some builders choose to glass the entire bottom, some the entire boat. The type of fiberglass resin used will have the greatest impact on cost.